We are rapidly moving through winter, and are in pretty good shape in terms of moisture. 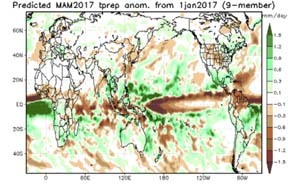 No major drought issues exist right now, which is fantastic! 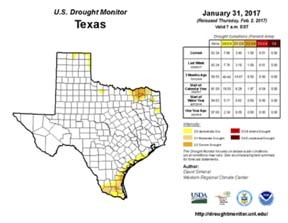 There are still a few dry areas in Northeast and Southeast Texas, but nothing huge. So, will those dry areas expand, hold steady, or shrink as we go through spring. 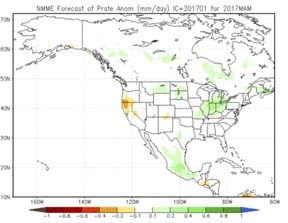 Let’s check out what some models are projecting for March, April and May. As you know, the green areas show where it is likely to be wetter than average and the brown areas show where it is likely to be drier than average. The JAMSTEC Model does show some dry potential in Northern Texas this spring, but the other models do not. 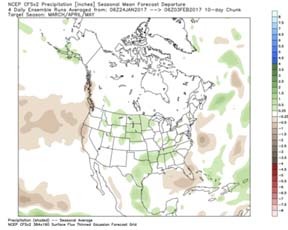 While I’m not that excited about the rest of February being all that wet, it does look like we have potential to have some decent moisture this spring. The Panhandle Region will likely end up the driest,with the best moisture favoring areas farther east. I did not post any temperature maps, because we will likely be warmer than average through the spring. ALL models are forecasting such, so nothing really to see there. I’ll provide an update on this next month as well.